In Minnesota I made some cute little friends, the eastern gray squirrels. They are my little friends who visit my patio every morning. How many of us, whether at home or travelling observe and have some little joys like these. 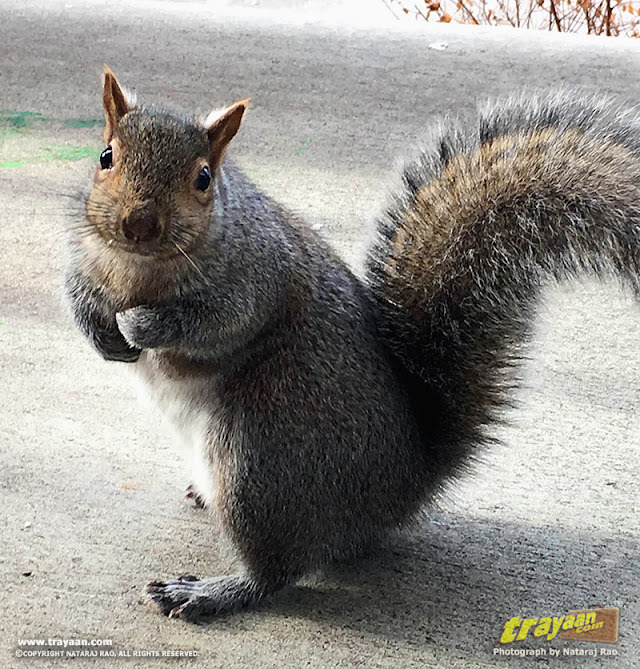 Here are some pictures of the totally cute eastern gray squirrels. While travelling, most of us go for the big picture; that is the glorious mountains, rivers, beaches, monuments and wildlife like the big cats, elephants and even culture. We go for all these too. But how many of us also look at the little things, the little creatures of a place that give us little joys, may it be an early morning, a late evening by our accommodation, or during our outings. Of course there are several bird enthusiasts and animal photographers, but the regular ones like us who travel for the sake of travelling or just to have a good time or to visit that must visit place. But how much do we observe nature and our surroundings? How many of us look at the little beauties around us? It could be a dog, a cat, some birds (including crows), or some squirrels. I always observe the environment and the animals and birds around me wherever I go, apart from the main motive of travelling somewhere. On Christmas night a snow storm marked itself as the first widespread snowfall event in Minnesota. Its 19F (-7 °C) outside, at the time I write this. Some of my little friends who visit my patio every morning looked famished. I treated them with some crackers (which they love) and also got a chance to take few snaps while they were enjoying their snack. These are the eastern gray squirrels which can grow 17 to 20 inches long and typically build a nest or live in the cavities of trees. During winter, with the trees loosing their leaves and due to scarcity of food, these squirrels are more visible. 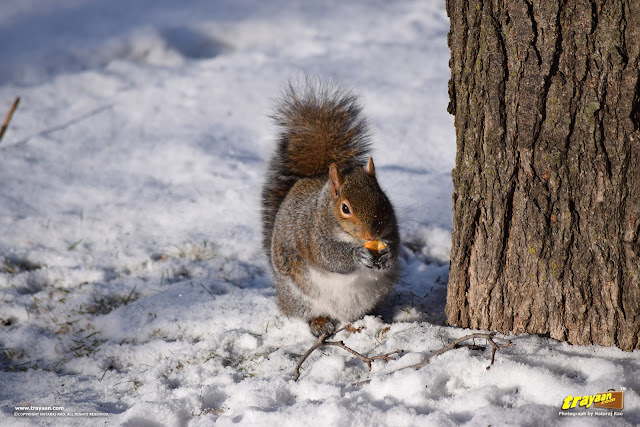 It appears that they build out a reserve of food mostly on the ground and during winter, it gets a little tricky to find where they had hidden their food. 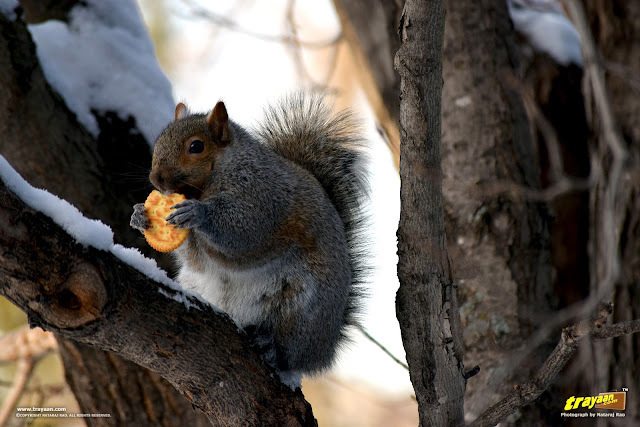 It is also said that squirrels keep themselves warm by shivering through which they generate heat. 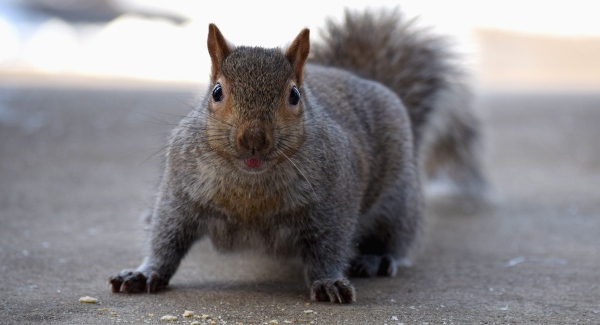 When I put out some crackers, I have seen at least four to six squirrels running towards them, to claim those. The one that gets first to the food becomes its sole owner. Its up to his discretion whether to share the meal or not. 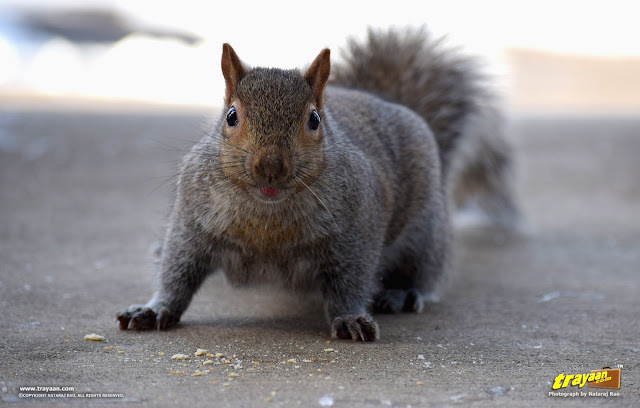 I have seen some squirrels that don't look as fluffy and strong as the others standing right next to the food and barking at other stronger squirrels. It’s nice watching these furry little creatures. They are different from the typical lined squirrels back in India. Wherever I have travelled, I never miss out on the animals and little creatures and have sometimes taken their pictures, but have never written or published them until now. For me, they are a part of my journeys and travels. I believe many others too would experience these little joys during their tours and travels, adding to their overall wonderful experiences. Are you one of them? Here is a small video of one of those cute little fellers. In fact, this is the first video we are ever uploading! The little squirrel just comes to me, takes the cracker from my hand, and goes away to eat it somewhere he likes.